The Great Salt Lake Bird Festival is coming up. Looking at the calendar, I’ve noted that it’s time to prepare for the upcoming 2013 Great Salt Lake Bird Festival (GSLBF) happening May 16-20. Since 2009, I have co-led a GSLBF birding field trip in downtown Salt Lake City with the expert assistance of bird watching enthusiast Terri Clemons. 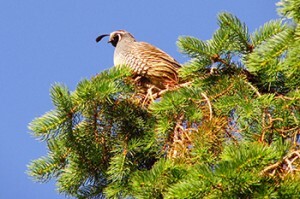 The excursion is called the City Center Bird Walk. A group of birders observes an adult peregrine falcon during last year’s Great Salt Lake Bird Festival. At the heart of the field trip are the nesting peregrine falcons in downtown Salt Lake City. In the fall, the nest box, found on the Joseph Smith Memorial Building (JSMB), was cleaned and prepped with hopes that the falcons would return in 2013. I received word from the Church of Jesus Christ of Latter-day Saints that the old webcams were being replaced with new, high-definition cameras. To my delight, the cameras went live on April 11, and not surprisingly, the falcon antics were already visible and their vocalizations audible. Another spring of falcon viewing is upon us. 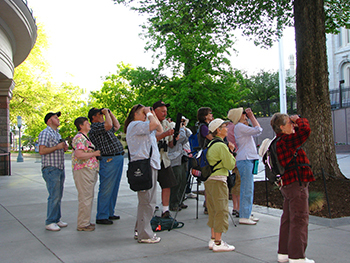 We’ll kickoff the City Center Bird Walk by entering Temple Square from the north visitor’s center entrance for a leisurely walk around the gardens. We’ll identify and count the birds that inhabit this little slice of wild in the heart of the big city. Adult peregrines, the stars of the field trip, are often times spotted at this point in the outing. Through spotting scopes and binoculars, they can be seen perched on surrounding building’s ledges or the decorative architectural features of the JSMB. The next part of the field trip includes a short walk to the entrance of Memory Grove where we’ll likely add to our list of birds found in the downtown area. Photo by Terri Clemons. Check out the bulleted list in the post for examples of what else you may see during the field trip. We’ll then proceed to the rooftop of the LDS Church Conference Center. This roof features a six-acre garden landscaped with trees, an alpine meadow of grasses, wildflowers, fountains and a waterfall. 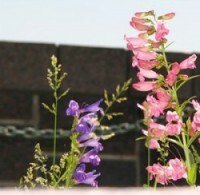 This sets the stage for the possibility of finding an unexpected species or two in a habitat that’s quite out of place in a downtown environment. Each time a bird is spotted throughout the field trip, all binoculars are trained on it and a best effort is made to clinch the identification. The final stop is at a room inside of the Joseph Smith Memorial Building where the peregrine webcam feed is projected on a huge wall monitor. While there is never any guarantee that exciting activities will be underway within the nest box, the May 20 field trip might allow for close observation of brooding or even feeding of young-of-the-year falcons. We’re adding to this list all the time! Sign up to attend the City Center Bird Walk online. Photo snapped by Terri Clemons during last year’s GSLBF. There are a variety of other field trips that you can sign up for during the five-day festival. From family owl night at the Ogden Nature Center to butterflies and birds for beginners, there’s a daytrip that’ll bring a smile to your face. There are also free, worthwhile presentations and workshops happening Friday and Saturday at the Davis County Legacy Events Center located at 151 S. 1100 W., Farmington, UT, 84025. Read more about the Great Salt Lake Bird Festival on the website.